The current lopsided look of the International Space Station as seen by Discovery shuttle astronauts during their STS-116 mission in December 2006. The P4 solar arrays can be seen at left. The International SpaceStation (ISS) and its astronaut crews routinely face a series ofpotentially disastrous risks in Earth orbit, an independent safety panelreported Tuesday. But available backup systems and procedures minimize thelikelihood of the most catastrophic scenarios. 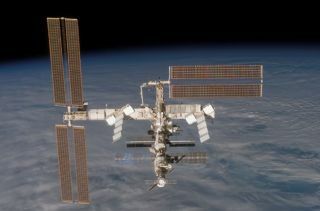 Impactsfrom space debris and micrometeorites topped a list of potentially seriousrisks that, if realized, could harm ISS astronauts,force an orbital evacuation, or destroy the half-builtspace station [image],according to a report released by the International Space Station IndependentSafety Task Force. The threatof collisions with visitingspacecraft or an ISSrobotic arm, onboardfires, and toxic spillsfollow closely after. Adeliberate attack on the station's systems from Earth or accidental critical command byMission Control is low on the list, the 119-page report stated. "Although the Task Force made a number of recommendations,the ISS Program was aware of the problems that result in vulnerabilities andwas developing improvements or had concepts to deal with most of the concerns,"the safety panel concluded in its report, but added that some critical risks -such as that posed by space debris - required additional attention. Congressordered the independent review of potential hazards to the ISS and itsexpedition crews in 2005. It was released simultaneously to Congress, NASA and the public Tuesday. The$100-billion orbital observatory is the result of an international agreementthat includes NASA and 15 other countries. Currently crewed by three-astronautteams, the ISS is expected to grow into a six-astronaut installation with asmuch habitable space five-bedroom home by 2010. Its exterior will rival a U.S. football field in length when complete [image]. "Most, ifnot all, of the things that are mentioned in the report have been on our radarfor some time," Allard Beutel, a NASA spokesperson at the agency's Washington, D.C. headquarters, told SPACE.com. "The plan is to take some time andread this thing cover to cover and come up with a comprehensive plan addressingthe recommendations of the report." Micrometeoriteand orbital debris (MMOD) impacts, fires, toxic spills and othertime-sensitive emergencies are the biggest threat to the ISS astronauts andhardware. The newreport found that, when complete, the station has a 55 percent chance of beingstruck by tiny space rocks or trash over a 10-year period, with a 9 percentchance of a catastrophic strike. Those chances could be reduced to 29 percent and 5 percent,respectively, by changing some Russian solar array orientations and installingnew impact-protecting panels to the exterior of the station's Russian-builtZvezda service module - which launched to the outpost in June2002 and December2006 aboard NASA shuttlesand are slated for installation during spacewalks set for April, the task forcereported. Delivering an adequate number of pressure covers for the Zvevzdamodule's windows, in case they are struck by debris and must be sealed, wouldhelped reduce MMOD risk to the ISS, it added. Ensuring cargo and crew access to the ISS beyond the planned2010 retirement of NASA shuttle fleet is also critical concern according to thetask force's report. The safety panel recommended the U.S. space agency consider maintaining two non-ISS construction-dedicated orbiter missions- ostensibly to ferry spare parts and supplies to the orbital laboratory - inthe agency's flight plan. Aclose watch on station astronaut health is also required, since studies ofsubmarine and Antarctica research crews found spontaneous illnesses severeenough to require medical attention could crop up every four to six years. "In aworst-case scenario, a spontaneous health event may necessitate returning thecrew to Earth for specialized medical attention, which would result intemporary abandonment of the ISS," the task force reported. Despite itsrecommendation, the task force conceded that flying humans in space will alwaysinclude safety concerns for flight crews. "It must be recognized that regardless of the efforts putforth, operating in space is, and will be for the foreseeable future,inherently risky and requires continuing discipline and diligence to maintainsafe operations," it reported.